Our charmingly renovated and furnished 200-year-old village house is perfect for self-catering holidays in non-peak seasons. Out the front door: the conveniences and vitality of a working French village -- including tractors down the main street(! ); out the back, an unobstructed view of the countryside from the terrace, plus the sound of a waterfall. Four bedrooms sleep eight comfortably and privately, yet just two will feel cozy, as well. With its small pool and garden with lavender and grapevines, the holiday house, villa, vacation rental, ferienhaus or somerhaus--depending on your language--is an ideal gathering place for friends or family or an idyllic retreat for writers, artists, or academics on sabbatical. Three toilets and shower-rooms/bathrooms (one on each level); sinks in two bedrooms, ceiling fans, fuel-fired central heat (important for off-season holidays!). The land behind the villa and its enclosed pool includes a small cottage garden. A communal path alongside the garden leads to the river's edge and a nearby waterfall. You will pass through the bountiful gardens maintained by villagers to the edge of the river. The surrounding French countryside is filled with vineyards.... great biking, kayaking, walking, etc., are within steps. Listen to the waterfall when enjoying meals on the terrace. A local tennis club is available on a per-hour or membership basis to visitors, and horseback riding is available nearby. You will be living in working village in rural France, not a tourist-crowded monument. Within steps are boulangeries, small shops, cafes, small markets, pharmacies, butchers, banks, post office, five wineries (in town), a traditional Saturday market, and a charming village of around 2500 people who actually like having visitors in town. You can be as isolated as you wish yet still stroll to the boulangerie for a croissant, then to the next door café for coffee. Daily fresh bread, of course, is right around the corner. Two small groceries and two fresh vegetable stores are steps away. On the outskirts of town is a larger supermarket if you feel the need for a stock-up. Even larger stores are in Brignoles, about 20 minutes away. Carcès and other picturesque villages nearby offer lively, engaging cultural activities on a regular basis: music concerts in medieval buildings, art openings, flea markets in village squares, market days that have occurred in the same villages on the same days for hundreds of years. Within a few minutes' drive, you will find half a dozen restaurants ranging from local specialties to the highly recommended cuisine that makes the south of France so appealing. Where in the world is Carcès? Carcès is an unspoiled village in the rosé-producing region of Provence. Located in the south of France, half-way between Nice and Marseille just north of the A8 auto route, the village is about an hour and a half from Nice, Marseille, Arles, Avignon; an hour from St. Tropez and the beaches of the Cote d'Azur, to Toulon or Hyeres to the south, an hour from the dramatic Gorges du Verdon to the north. In just 45 minutes, drive west to Aix-en-Provence to walk in the footsteps of Cezanne. Drive just two hours east for lunch in Italy. Or, stay 'home.' Fishing out the back door; horseback riding down the road; biking in vineyards and through picturesque villages nearby; the Lac de Carcès is within hiking or biking distance. A great location and an ideal accommodation. Ken & Betsy live in San Francisco; Scottsdale, Arizona; and in Carcès. Ken is a retired professor of photojournalism at San Francisco State University, an author and inventor. He continues to make video documentaries. Betsy is a retired a freelance writer, editor and publication designer. Ken is the author of the textbook "Photojournalism: The Professionals' Approach" and inventor of Professor Kobré's Lightscoop®. Ken also publishes KobreGuide point com, a curated website guide to the Web's best videojournalism. Betsy is the photojournalism book's designer and editor, and former COE (Chief of EVERYTHING) for the retired Lightscoop. Betsy is a pro bono director of HandUp Congo (handupcongo point org). Ken and Betsy also are co-authors of the 7th and 8th editions of another textbook, "Photography," which was based on the original Time/Life series of photography books. Ken is 73. Betsy is, well, 4 years younger. We fell in love with Provence during several home exchanges in the area. When we decided to look for our own place, we both wanted a village house, where we could be part of daily life. Neither of us wanted a renovation (no good at that in the States... sure couldn't imagine it in France). Betsy wanted a garden. The intersection of all these desires turned out to be in Carcès. We love living here because we're so well situated, both in the village and in the region. In addition to our Saturday market in Carcès, we're regulars at the Salernes Sunday market & the Tuesday market in Lorgues or Cotignac. We can be in Nice, Marseille, or even Arles in around 90 minutes. Aix-en-Provence is 45 minutes away. The Cote d'Azur is an hour away. Another of the great things is that there are art and entertainment opportunities occurring close by, as well... from jazz to contemporary art. We're out and about a LOT. We love the climate... even in the hottest weather, the stone walls in our house keep us cool... and in winter, the heat stays inside for the same reason. Amazing. toilet, combination tub/shower, Double sinks. Plus sinks in TWO bedrooms on this level. If you are looking for a genuine experience, you have come to the right place! 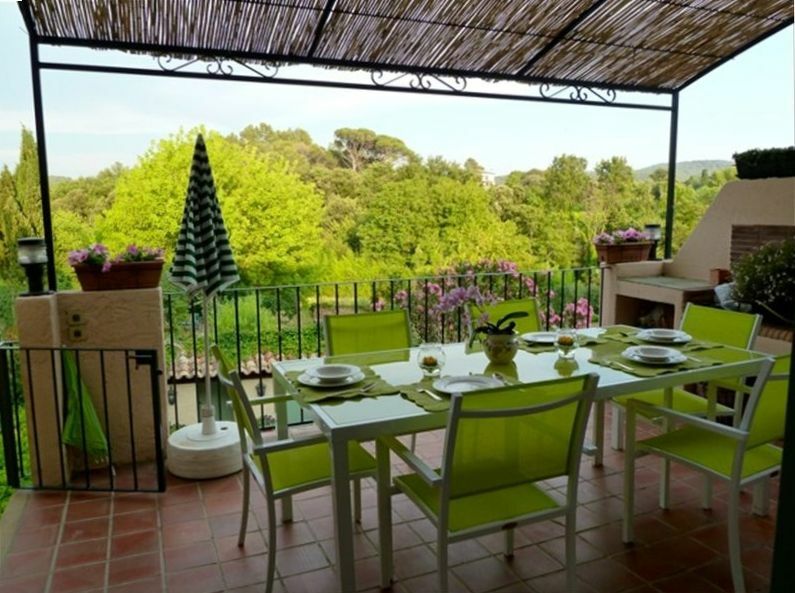 Situated right in the tiny village of Carces, this rental was easily accessible, had everything we could need, and central to all the places you would want to visit in Provence. The house was clean, beds were comfy and the people in the village were friendly and welcoming - even if your French is poor! Definitely a great place to explore the south of France. We thoroughly enjoyed our 5 month stay at this beautiful property. The description of the property and house are accurate and the photos depict the house and grounds as we found them. The house is spacious, comfortable, charming and well equipped. The owners are responsive and friendly. The town is well situated for day trips in and around Provence and both the French and Italian Riviera and only an hour and a bit from the Nice Airport. We would definitely book this property again! Our group of four stayed in Carces for a total of three weeks. Sad to say, everyone of us got sick, some before we arrived, some after, and from different ailments, none of which were attributable to this lovely, quiet, comfortable house, full of light even when the temperatures were chilly outside and we were seriously concentrated on making chicken soup. We also got well, and had time to drive about to Cotignac and Aix and Frejus, easy little day trips to fascinating adventures. Whether you're sick or well, this house is a great place to work, play, and especially cook - it has the best kitchen of any house we've ever stayed in abroad, and everything you need to whip up something fantastic is literally steps away. Carces is not fancy, but sweet, with a great market, and friendly shopkeepers. We were particularly taken with the pharmacist, a brilliant diagnostician who gave us great medicine for very few Euros. If only we could have taken him home. All in all, we recommend this beautiful home - and it gets to feel like home very quickly. Lovely terrace and garden - even in late December we had breakfast in the warm sun. So many places to relax with a book, or if you can't bring yourself to disconnect, excellent wireless service. When the time came, we were sad to leave. After 56 years of nursing, I treated myself to a 200 year old winemakers house and it did not disappoint. I rented it for 1 month and had family and friends arrive in 1 week increments. 4 bedrooms and 3 baths accommodated all generously with room to spare. Trips to St Tropez, Monaco, Cannes, Avignon were just 90 minutes away on A8 ( have change for tolls). Carces is quintessentially French with shops right around the corner. The grocer, Pierre, spoke perfect English should you need it. Restaurants were all within walking distance. Jogging out the front door along vineyards with only a farmer on his tractor was a treat for my son. The back of the house had a beautiful terrace where we ate breakfast and had our cocktails. All appliances worked perfectly when instructions were followed. We had fun hanging the laundry on the clothesline or conveniently in the garage in inclement weather. All in all, a perfect home which was full of cheer and comfort and a cleaning crew weekly. A grand adventure for one and all. Thank you for our delightful stay! We all loved the sound of the waterfall and the pretty view in the backyard. The people in Carces were very friendly, too. The boulagerie owners always remembered our favorites and would include free extra pastries for our appreciative boys, the small grocery owners would chat with us in the store and when they would see us outside, and the pizzeria workers enjoyed visiting and even knew our state's capital! :-) The home was well supplied with plenty of room for our family of 7, and we even managed to fit our 8 passenger rental van in the garage with about 6" to spare on each side after folding in the windows (and with some help from our boys to guide us in and out). The location in central Provence was convenient as well, and we went all over from Monaco to St. Tropez to Nimes, and many places in between. Where do we begin? This wonderful home which upon approach appears ever so humble, is revealed to be anything but once you walk through the front door and up the stairs. From the majestic views visible from the back of the property to the soft sounds of rushing water we found it difficult to leave our new found paradise.Days were spent exploring and sampling the region, Evenings were spent around the crackling fire sipping wine, purchased from local vineyards. This home is located in the charming town of Carces perfectly situated an hour or so to the famous towns of St Tropez, Aix,St Remy de Provence, Nice, etc etc.... It was our first visit to the Var region and certainly will not be our last, Rolling hills, vineyards, olive groves and charming small unaffected towns all came together to contribute to one of our most enjoyable trips to France to date, Thank you Betsy for everything! We loved your home. Cancellation policy: Once received, payments are 100% refundable IF we can rebook your cancellation. Truly, we will make every effort to rebook our home. The earlier the notice, of course, the more we are likely to succeed. In that case, you will receive a refund less our expenses if we incur any. For your ultimate protection, we STRONGLY recommend the purchase of trip cancellation insurance. We are just a nice couple sharing our home with people like you -- and not a professional agency. Please recognize that you will be guests in our home -- not a hotel, resort, or professional property. We do everything that every responsible and loving homeowner does to maintain a healthy, happy, safe, secure, and functional home to share with our guests, friends, and families, but we cannot accept liability for accidents, death, loss or damage to persons or personal effects, however caused.